Anyone who has paid any interest in Subaru vehicles should have heard about the boxer engine. I came to know about boxer engines through Subaru vehicles. Although I love the Mitsubishi Evolutions I must admit that Subaru is a trusted brand for Rally cars and their cars have won numerous titles. Do you think the boxer engine contributes to this? Not entirely but yes. Before I explain I'll give a brief explanation of the concept. This engine goes through the same 4 strokes in the same manner as the regular engine, the difference is the direction of the pistons. The pistons in the boxer engine move in a horizontal manner, meaning forward and backward in a similar movement to a human boxer. Forward movement represents an up stroke and the backward movement represents a down stroke. Another way the engine is similar to a human boxer is in the layout of the pistons. 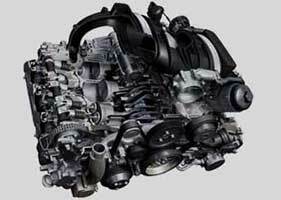 In a 4 cylinder boxer engine, the 4 pistons are not inline, but there are 2 pistons on each side of the crankshaft like 2 arms. 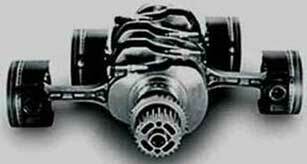 It is a similar concept to a V engine at a 180 degree angle. Each piston has it's own crank pin so the 2 pistons on a side will not be punching forward at the same time. 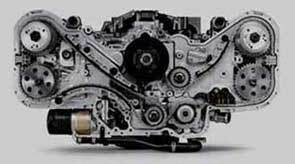 The reason why I said yes earlier to the boxer engine contributing to Subaru's success is because the engine perfectly balances itself as each piston is counterbalanced by the corresponding piston on the opposite side which also contributes to Subaru's symmetrical all wheel drive. Vehicles with boxer engines benefit from greater stability and control as the design and layout of engines will result in a lower centre of gravity for the vehicle. The drawbacks are these engines are wider than the regular engine, so a 2.0 litre 4 cylinder boxer engine will be wider than a regular 2.0 litre engine. The boxer engine is not cost effective to manufacture when compared to a regular engine and it will be complicated as 2 pistons on each side will have their own engine head and camshafts. This photo shows a 6 cylinder Porsche flat engine partly cutaway showing the cylinders.